I am ever conscious of gaps that remain in the history I’m writing of queer Metro Detroit, vital parts of the larger narrative that mustn’t be given short shrift, stories that I don’t want to leave out. In the midst of the process, I’ve also been thinking of people that I still long to find and learn from, even after conducting years of research and interviewing well more than a hundred individuals. Locating people has sometimes been tricky. I’ve been hindered by the mask that society forced LGBTQ people to wear, the proverbial familiar faces, hidden lives of the closet. Before and after Stonewall, people often used pseudonyms. For years I had two names for the founder of ONE in Detroit, Chuck Thompson and Chet Sampson, and only found him, still living in Los Angeles in 2004 at age 83, when I identified Chet Sampson as his real name. A different Chuck Thompson, the one who took over Cruise magazine from Tony Rome, was also using a pseudonym. So was Tony Rome. As were Ann Carll Reid, Ray West, James Coleman, Eve Elloree, Russ Knight, Phil Greene, and Susan Williamson. Finding female impersonators, whose stage names typically shielded their true identities, has presented its own challenges. As I discussed here several months ago, it took me 17 years to find Jerri Daye. Other people may have changed their names, or had names too common to track down or lost touch with friends or moved away. So, for the “hive” of readers of this blog, whoever you may be, I present this roster of people I would love to find. I realize some may now be deceased, but others surely are not. I welcome any information you might offer to help in this quest. Priscilla Dean, prominent female impersonator in the Black Drag scene of the early 1950s and hostess at Uncle Tom’s Plantation. Big Red, a red-haired white bartender (and/or bouncer) at the Palais in the 1950s who has been mentioned by many patrons of the iconic lesbian bar. Gary Doliver, a onetime Milford resident who, as a white 24-year-old, witnessed the apprehension of Billy Highstand by police one night in July 1957 and sought to intervene when Highstand resisted arrest. Robert Swetman, a white female impersonator from Mississippi who performed as Bobbi Johns at the Diplomat in the early 1960s. Buddy, a black autoworker at Chrysler’s Eldon Gear and Axle plant referred to as “she” in the late 1960s and remembered for wearing go-go boots and heavy perfume. Sunny King, a white, lesbian early member of the Detroit Gay Liberation Front in 1970 and first editor of the Gay Liberator. Terry Gardner, a black lesbian who castigated the Detroit GLF for its alleged racism and sexism before quitting the group in 1971. Kwame Keita, who may have also gone by Bill Hill, a member of the Third World Caucus of the Detroit GLF who left the GLF for ignoring issues of race. Mike Fylstra, a white Gay Liberator writer arrested for accosting and soliciting in 1971 who challenged the charge in court. 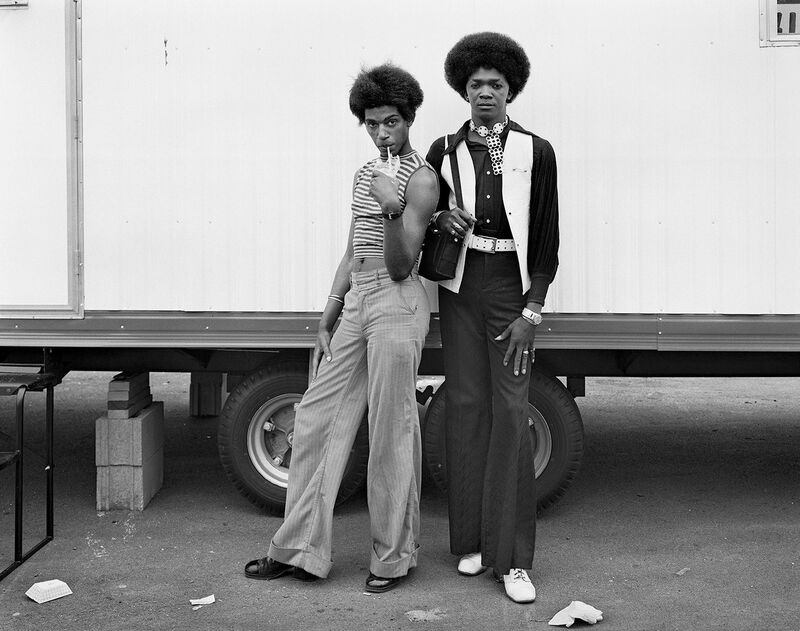 A pair of unidentified African-American men in their 20s identified as “Two Gay Libbers,” who posed for photographer Dave Jordano in 1973. Ann Lewis, who with Ken Dudley founded the organization Detroit Black Gays in response to a series of anti-gay slayings of African-American gay bar customers in 1973. Herbert “Bo” Taylor, who lived at 885 Covington in Palmer Park and who was first president in 1976 of the Association of Suburban People and one of the few African Americans involved in the organization. James Stevens a.k.a. Buttons LaWalker, black performer at Menjo’s, Bookie’s, and other gay clubs in the mid-1970s, who won the Miss Gay Detroit title in 1977. S. Lowery, J. Parker, and V. Williams, who were officers of Frontrunner, a gay black uplift organization begun in 1977 to host formal dances as fundraisers for the gay community. Michael Ray, the bearded white gay editor of Metra magazine in the early 1980s. Jone Lynch, who wrote for Metra magazine in the early 1980s and who was one of a small number of lesbians involved in the Association of Suburban People. I would relish discovering the whereabouts of even a few of these elusive folks of yesteryear. Their role in Metro Detroit LGBTQ life and activism deserves to be remembered. And yes, I do need to get my book done. Last I heard Buttons Lawalker was living in the Chicago area I believe.